Introduction: The objective of this study is to assess and compare shear bond strength (SBS) using different bonding techniques in amelogenesis imperfecta (AI) cases. Materials and Methods: Totally 30 extracted premolars from AI cases and 10 premolars from normal cases were obtained. 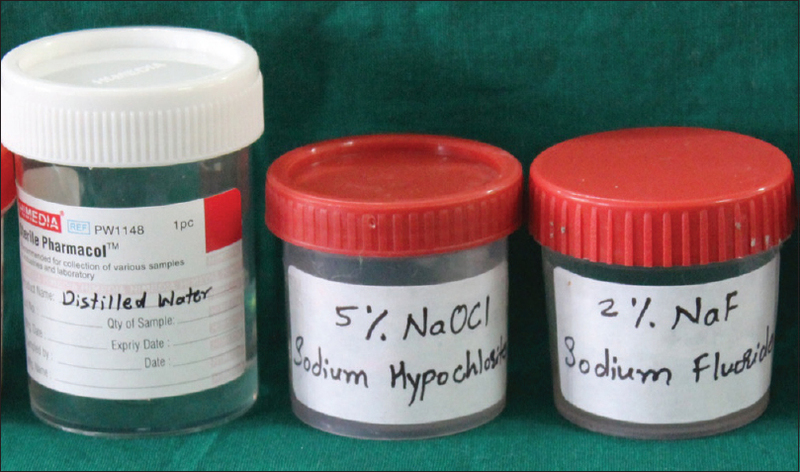 The first group of (10) normal samples was treated with 37% orthophosphoric acid (H3PO4), second group (10) of AI cases was treated with conventional technique (37% H3PO4), third group (10) with sodium hypochlorite (5% NaOCl), and fourth group (10) with 2% sodium fluoride (2% NaF). Brackets were bonded using Transbond XT light curing adhesive and SBS was measured using the Instron universal testing machine. Results: Statistically highly significant difference observed between the strengths of all four groups (P < 0.01) with the mean highest for control group followed by NaF conditioning and NaOCl conditioning and least for conventional bonding procedure in AI cases. On pairwise comparison using Tukey's post hoc test, statistically highly significant difference was observed between the mean SBS for control group versus Group 2, Group 3, and Group 4, Group 2 versus Group 3, and Group 2 versus Group 4. Conclusion: Brackets bonded by conventional technique showed lower SBS as compared to NaOCl and NaF in AI cases. The application of 2% NaF gel for 4 min before acid etching of hypomineralized tooth surface shows significantly higher SBS as compared to conventional and NaOCl group in AI cases. The success or failure of an orthodontic treatment can be greatly determined by the bonding of orthodontic attachments. The principle of bonding attachments to the enamel is based on micromechanical interlocking of the adhesive resin with the enamel. High failure rates of resin bonding using the current conventional technique are reported in amelogenesis imperfecta (AI) cases wherein the enamel is reduced or may even be completely absent. This study has given us an insight into different bonding techniques in such cases which might bring down the failure rates associated with bonding and thus the cost associated with maintenance. The fundamental principle of bonding to dental hard tissues is based on micromechanical interlocking of the adhesive resin with the enamel and dentin. While bonding to enamel depends on the micromechanical retention to the etched substrate, bonding to dentin relies on hybridization with the exposed collagen mesh. A significant number of patients seeking orthodontic treatment have local or generalized hypomineralized areas in one or more teeth due to hereditary or environmental factors. Enamel hypomineralization may be a result of incipient caries or may be due to a systemic condition known as molar incisor hypomineralization. AI is a heterogeneous group of hereditary disorders that may affect the enamel of some or all teeth in the primary and/or permanent dentition. The estimated frequency of AI in the population varies between 1:718 and 1:14.000 in the western population. AI affects 1 of 14,000–16,000 children in the United States. The diagnosis of AI frequently presents with sensitive and discolored teeth. Poor dental esthetics is the result of surface roughness, staining, and abnormal crown shapes from enamel loss. Clinical management is considered to improve the poor appearance and function of the affected teeth using bonded restorations. Clinical presentation of AI varies according to its type. In the hypomaturation type, the affected teeth exhibit mottled, opaque white-brown yellow-discolored enamel, which is softer than normal. In radiographs, the thickness of enamel is normal, but its density is the same as that of the dentin. The hypocalcified type shows pigmented, softened, and easily detachable enamel. Radiographically, enamel thickness is normal, but its density is even less than that of the dentin. In the hypoplastic type, the enamel is well mineralized, but its amount is reduced. Clinically, grooves and pits will be realized on the surface of the fine enamel. The rough pattern of hypoplastic type exhibits thin-, hard-, and rough-surfaced enamel. The tooth is tapered toward the incisal/occlusal face and has open contact points. Radiographs exhibit a thin peripheral outline of radiodense enamel and low or absent cusps., Clinical and radiographic appearances of the teeth of our cases were harmonious with hypomaturation-type AI. In this study, diagnosis of hypomaturation-type AI is based on the family history, clinical observation, and meticulous recording which form the backbone of diagnosis. 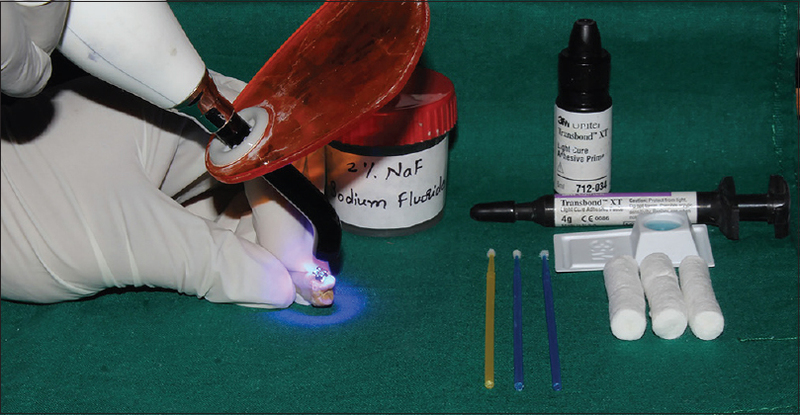 In this study, two chemical solutions (sodium hypochlorite [NaOCl] and sodium fluoride [NaF]) were used to improve bond strength in AI cases. According to De-Deus et al., NaOCl eliminates the organic matter present on the enamel surface by dissolving it. When enamel is deproteinized with NaOCl, more Types 1 and 2 patterns of conditioning were found, while without NaOCl, more Type 3 patterns were found. According to Silverstone et al. (1975), the more retentive etching patterns are Types 1 and 2 because the porous surface offers more retentive areas of greater size and depth. NaOCl as a deproteinizing agent is a possible strategy to optimize adhesion by removing organic elements of the enamel structure before acid etching. NaOCl has an antibacterial effect. Its mechanism of action has been explained by Solera and Silva-Herzog. The hydroxyl ion binds to calcium ions denaturalizing protein formation of CaOH2. The mechanism of action of fluoride gel is considered to result from its local action on the tooth plaque interface through promoting remineralization and by reducing tooth enamel solubility. Enamel demineralization is markedly inhibited if fluoride is present at the time of acid challenge because fluoride diffuses with the acid from plaque into the enamel and acts at the crystal surface to reduce mineral loss. When pH rises following demineralization, fluoride can combine with dissolved calcium and phosphate ions to precipitate or grow fluorapatite-like crystalline material within the tooth. Fluoride enhances this mineral gain and provides a material that is more resistant to subsequent acid attack. 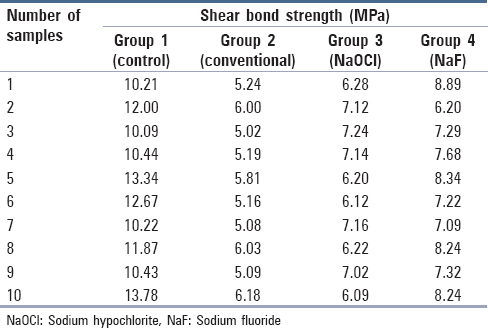 Hicks and Silverstone reported that fluoride treatment followed by acid etching of demineralized enamel produced the highest shear bond strength (SBS) in teeth with demineralized enamel. Previous studies found that fluoride treatment followed by acid etching of caries-like lesions provided etching patterns that were suitable for adhesive placement, while creating a rapid supply of fluoride for remineralization that reharden the enamel. The same has been reported by Shahabi et al. who found that application of 2% NaF before acid etching of demineralized enamel caused a significant increase in bond strength of orthodontic brackets. It has also been demonstrated that fluoride treatment followed by acid etching of hypomineralized enamel can produce etching patterns similar to those observed in etched sound enamel, while restoring the mineral lost during lesion formation. The essence of adhesion depends on achieving the best acid etching, with a generalized retentive morphological condition over the enamel and the dentine surface. 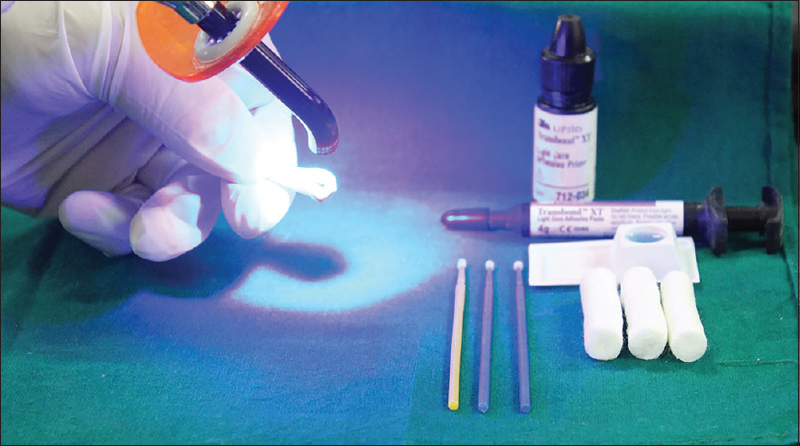 High failure rate of resin bonding using the current conventional technique is reported in AI cases wherein the enamel is reduced resulting in hypersensitivity (Ohsawa, 1972; Van Meerbeek et al., 2001). Topical fluoride is especially important in such AI patients because of their high risk of caries and it may also reduce hypersensitivity to a significant extent and improve this effect when associated with the occlusion of the dentin tubules. Frequent bracket debonding in AI or hypomineralized cases is a common shortcoming in clinical orthodontics and might delay treatment completion and increase the costs relative to the maintenance of fixed orthodontic appliances. Hence, the purpose of this study is to assess and compare SBS using different bonding techniques in AI cases. 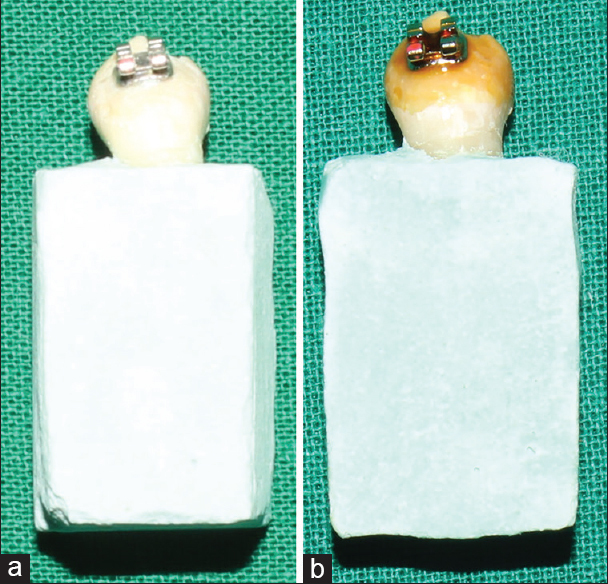 30 extracted premolar teeth from AI cases (hypomaturation type) and 10 extracted premolar teeth from normal cases stored in distilled water [Figure 1]a and [Figure 1]b. 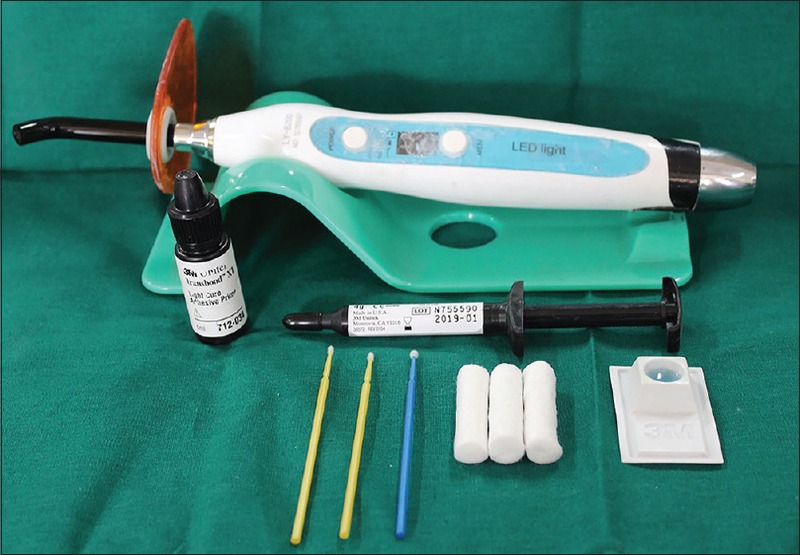 Bonding kit – 37% phosphoric acid, Transbond XT primer, Transbond XT adhesive, applicator tip, and light-emitting diode (LED) [Figure 3]. 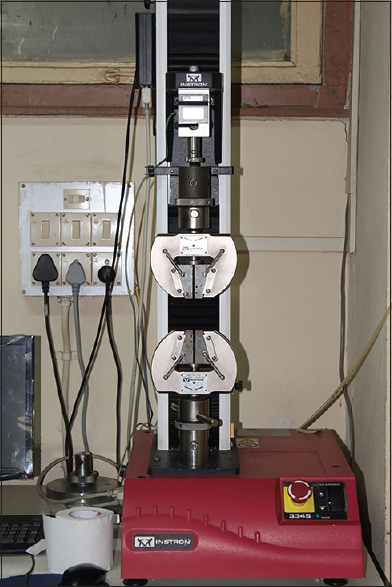 Universal testing machine (UTM) [Figure 4]. A sample of 30 extracted premolar teeth from hypomaturation-type AI cases and 10 extracted premolar teeth from normal cases who were undergoing orthodontic treatment. Group IV (10): NaF conditioning. 37% orthophosphoric acid was applied to the tooth surface and left for a period of 15 s. The tooth was then washed and air-dried until a dull frosty appearance was seen. The procedure was done for all the test specimens to be bonded with three different bonding techniques to be evaluated. Group 1 (control): Teeth surfaces were etched with a 37% phosphoric acid gel for 15 s. The tooth was rinsed with a copious amount of water and dried with an oil-free air spray. Then, a thin coat of Transbond XT primer (3M Unitek) was applied on the surface and the bracket was placed in the center of the crown with the use of Transbond XT adhesive (3MUnitek). The excess composite was removed from the periphery of the base with a dental explorer and the bracket was light cured for 40 s from occlusal, gingival, mesial, and distal directions using Bluephase LED as shown in [Figure 5]. Group 2 (conventional): The bonding procedure was the same as the control group (Group 1), but brackets were bonded on hypomineralized enamel (hypomaturation AI) as shown in [Figure 6]. Group 3 (NaOCl): Teeth surfaces were etched with a 37% orthophosphoric gel (H3 PO4) for 15 s, then rinsed with copious amount of water, and dried with an oil-free air spray. A 5% NaOCl solution was applied on the enamel surface for 1 min, then rinsed with water, and air-dried. Again, teeth surfaces were etched with a 37% phosphoric acid gel for 15 s. The tooth was rinsed with a copious amount of water and dried with an oil-free air spray. Then, a thin coat of Transbond XT primer was applied on the surface and the bracket was placed on crown with the use of Transbond XT adhesive and then light cured with Bluephase LED as shown in [Figure 7]. Group 4 (NaF): In this group, a 2% neutral NaF gel was applied on the enamel surface for 4 min. Subsequently, the teeth were rinsed with water for two consecutive periods of 5 min each after application of NaF for 4 min to remove any readily soluble reaction products, which if not removed can interfere with etching process affecting bond strength. Then, the teeth were etched with 37% phosphoric acid gel, then rinsed with water, and air-dried. Then, a thin coat of Transbond XT primer was applied on the surface and the bracket was placed on center of crown with the use of Transbond XT adhesive and then light cured with Bluephase LED as shown in [Figure 8]. All the bonded teeth were kept in distilled water at 37°C for 24 h and then mounted in dental stone so that the buccal surface of the tooth was parallel to the direction of the debonding force [Figure 9]. SBS was measured using the Instron UTM. 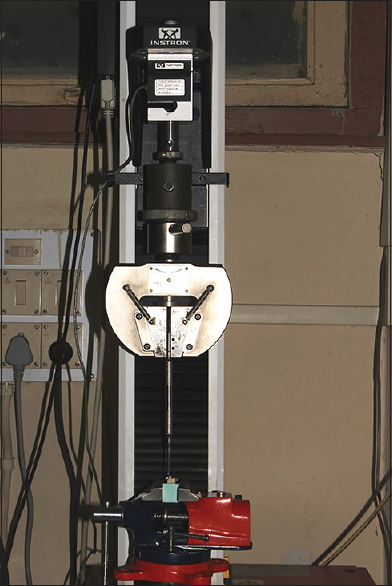 A parallel knife edge shearing device was aligned 0.05 mm from the bonded interface and force was applied to cause debonding using a crosshead speed of 1 mm/min. The stress value was recorded [Figure 10]. [Table 1] explains the numerical values of the SBS of the ten samples examined in each group. Lowest SBS was recorded in Group 2 at 5.02 MPa and the highest in Group 1 at 13.78 MPa. Data obtained were compiled on a MS Office Excel Sheet (v 2010). Data were subject to statistical analysis using the Statistical Package for the Social Sciences (SPSS v 21.0, IBM, Armonk, New York, The United States of America). Intergroup comparison of mean SBS (between the groups) was done using one-way ANOVA followed by pairwise comparison using post hoc Tukey's test. For all the statistical tests, P < 0.05 was considered to be statistically significant, keeping α error at 5% and β error at 20%, thus giving a power to the study as 80%. [Table 2] describes the mean SBS of the four groups with the respective standard deviation. The lowest mean SBS was recorded in Group 2 at 5.48 and the highest in Group 1 at 11.505 followed by Group 4 at 7.651and Group 3 at 6.659. [Table 3] presents the results of the post hoc test wherein each group's mean SBS has been compared with the mean of the other three groups. Group 2 versus Group 3, Group 2 versus Group 4. However, there was a nonsignificant difference between Group 3 and Group 4 (P > 0.05). MPa values are statistically similar/not different for Group 3 and Group 4. 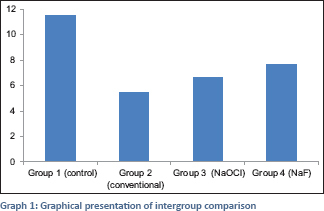 [Table 4] describes the results of the one-way ANOVA test between the four groups and within the groups. The difference between the four groups was found to be statistically significant. There was a statistically highly significant difference between the strengths of all four groups (P< 0.01) with the mean highest for control group followed by NaF conditioning and NaOCl conditioning and least for conventional bonding procedure. [Graph 1] presents graphical interpretation of mean SBS values of the four groups with the Group 1 (control group) showing highest SBS at 11.505 followed by Group 4, Group 3, and Group 2 in decreasing order of bond strength. Major concern associated with AI cases is altered quality and quantity of enamel, which can make the attachment and retention of fixed brace problematic. The chemical composition and mechanical properties also vary with the extent of hypomineralization, which influences the bonding performances. Hiraishi et al. in their study showed that bonding could not be improved by increasing etching time in AI cases. Keeping this finding in mind, the etching time was kept similar in all three groups. A reduction in mineral content and an increase in protein content pose great challenges to bonding to teeth with AI using adhesive restorative materials. The action of H3 PO4 on the enamel occurs mostly on the mineralized tissue (inorganic matter). Moreover, H3 PO4 does not eliminate the organic matter. In AI cases, outer organic layer prevents the conventional 37% H3 PO4 from effectively etching the surface resulting in inconsistent pattern and an unreliable enamel surface for bonding. Thus, it is necessary to remove the organic matter from the enamel surface to enhance the quality of etching pattern, which gave rise to the concept of deproteinization. Venezie et al. reported in their study that pretreating enamel affected by AI with NaOCl would make the enamel crystals more accessible to the etching solution, resulting in a clinically more favorable etched surface. William et al. recommended initial etching of the hypomineralized defect with 37% phosphoric acid, applying 5% NaOCl and then re-etching the enamel surface before resin placement. This technique provides better bonding and reduces the amount of microleakage. These findings are in line with the results of present study, which also shows an increase in SBS in samples treated with NaOCl. Some authors believe that self-etching adhesives bond better to hypomineralized enamel than total-etch systems. However, Adebayo et al. detected that the bond strength of self-etch adhesives was not influenced by enamel hardness. In general, there are a limited number of studies that have evaluated effect of fluoride treatment in AI cases. Fluoride treatment before acid etching of enamel can restore the mineral lost during lesion formation while providing etching patterns that are suitable for composite placement. Schmidlin et al. reported that fluoride-treated, acid-etched demineralized enamel allowed good penetration of bonding agent. This also can be attributed to increased SBS. With higher concentration topical fluoride vehicles (such as NaF gels), CaF2 is precipitated on the enamel surface. This CaF2 acts as a fluoride reservoir that is released when pH falls. Thus, gels deliver fluoride to the surface of enamel and to the subsurface hypomineralized lesions, where it forms deposits of CaF2 and provides a reservoir of fluoride ions, and the amount of fluoride deposition in the subsurface lesion is greater after topical applications with such high-concentration fluoride applications. A limitation of the present study was that it determined the short-term effects of different surface treatments in AI cases, while in clinical conditions, brackets are generally left in the oral cavity for nearly 2 years or even more. Hence, further research is required in this field to find more suitable protocols to be followed while bonding brackets in AI cases. Brackets bonded by conventional technique showed lower SBS as compared to NaOCl and NaF in AI cases. 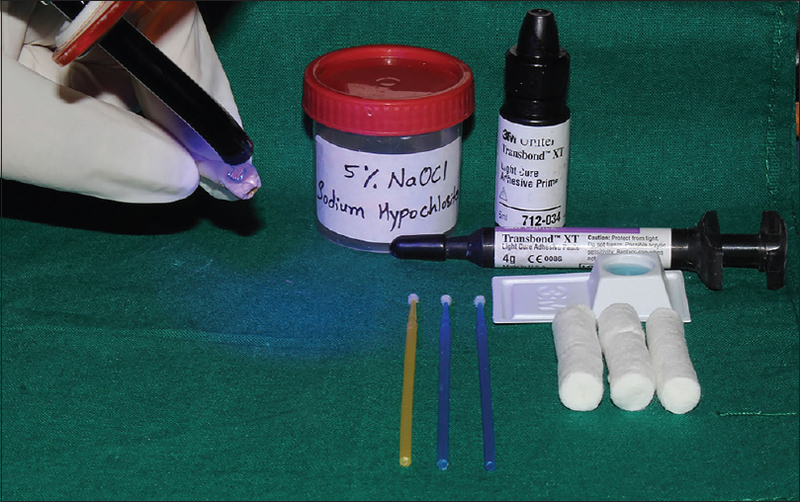 The application of 2% NaF gel for 4 min before acid etching of hypomineralized tooth surface shows significantly higher SBS as compared to conventional and NaOCl group in AI cases. Yahyazadehfar M, Bajaj D, Arola DD. Hidden contributions of the enamel rods on the fracture resistance of human teeth. Acta Biomater 2013;9:4806-14. Gwinnett AJ. Structure and composition of enamel. Oper Dent 1992;Suppl 5:10-7.
van Meerbeek B, De Munck J, Yoshida Y, Inoue S, Vargas M, Vijay P, et al. Buonocore memorial lecture. Adhesion to enamel and dentin: Current status and future challenges. Oper Dent 2003;28:215-35. Nakabayashi N, Kojima K, Masuhara E. The promotion of adhesion by the infiltration of monomers into tooth substrates. J Biomed Mater Res 1982;16:265-73. Moosavi H, Ahrari F, Mohamadipour H. The effect of different surface treatments of demineralised enamel on microleakage under metal orthodontic brackets. Prog Orthod 2013;14:2. Bailleul-Forestier I, Molla M, Verloes A, Berdal A. The genetic basis of inherited anomalies of the teeth. Part 1: Clinical and molecular aspects of non-syndromic dental disorders. Eur J Med Genet 2008;51:273-91. Ng FK, Messer LB. Dental management of amelogenesis imperfecta patients: A primer on genotype-phenotype correlations. Pediatr Dent 2009;31:20-30. Aldred MJ, Savarirayan R, Crawford PJ. Amelogenesis imperfecta: A classification and catalogue for the 21st century. Oral Dis 2003;9:19-23. Hiraishi N, Yiu CK, King NM. Effect of acid etching time on bond strength of an etch-and-rinse adhesive to primary tooth dentine affected by amelogenesis imperfecta. Int J Paediatr Dent 2008;18:224-30. Neville BW, Douglass DD, Allen CM, Bouquot JE. Abnormalities of teeth. In: Oral and Maxillofacial Pathology. 2nd ed. Pennsylvania: Elsevier; 2004. p. 89-94. Solera JR, Silva-Herzog D. Microbiologia basica en endodoncia Rev. AME 2006;6 Suppl 4:22-9. Featherstone JD, Ten Cate JM. Physicochemical aspects of fluoride-enamel interactions. In: Ekstrand J, Fejerskov O, Silverstone LM, editors. Fluoride in Dentistry. Copenhagen: Munksgaard; 1988. p. 125-49. Ten Cate JM. Current concepts on the theories of the mechanism of action of fluoride. Acta Odontol Scand 1999;57:325-9. Schmidlin PR, Zehnder M, Pasqualetti T, Imfeld T, Besek MJ. Penetration of a bonding agent into De- and remineralized enamel in vitro. J Adhes Dent 2004;6:111-5. Shahabi M, Moosavi H, Gholami A, Ahrari F.In vitro effects of several surface preparation methods on shear bond strength of orthodontic brackets to caries-like lesions of enamel. Eur J Paediatr Dent 2012;13:197-202. Hicks MJ, Silverstone LM. The effect of acid-etching on caries-like lesions treated with stannous fluoride. J Dent Res 1983;62:783-8. Petersson LG. The role of fluoride in the preventive management of dentin hypersensitivity and root caries. Clin Oral Investig 2013;17 Suppl 1:S63-71. Rada RE, Hasiakos PS. Current treatment modalities in the conservative restoration of amelogenesis imperfecta: A case report. Quintessence Int 1990;21:937-42. Seow WK. Clinical diagnosis and management strategies of amelogenesis imperfectavariants. Pediatr Dent 1993;15:384-93. Saroǧlu I, Aras S, Oztaş D. Effect of deproteinization on composite bond strength in hypocalcified amelogenesis imperfecta. Oral Dis 2006;12:305-8. Ekambaram M, Yiu CKY. Bonding to hypomineralized enamel – A systematic review, International Journal of Adhesion and Adhesives, September 2016;69:27-32. Venezie RD, Vadiakas G, Christensen JR, Wright JT. Enamel pretreatment with sodium hypochlorite to enhance bonding in hypocalcified amelogenesis imperfecta: Case report and SEM analysis. Pediatr Dent 1994;16:433-6. Adebayo OA, Burrow MF, Tyas MJ, Adams GG, Collins ML. Enamel microhardness and bond strengths of self-etching primer adhesives. Eur J Oral Sci 2010;118:191-6. Tandon S, Mathew TA. 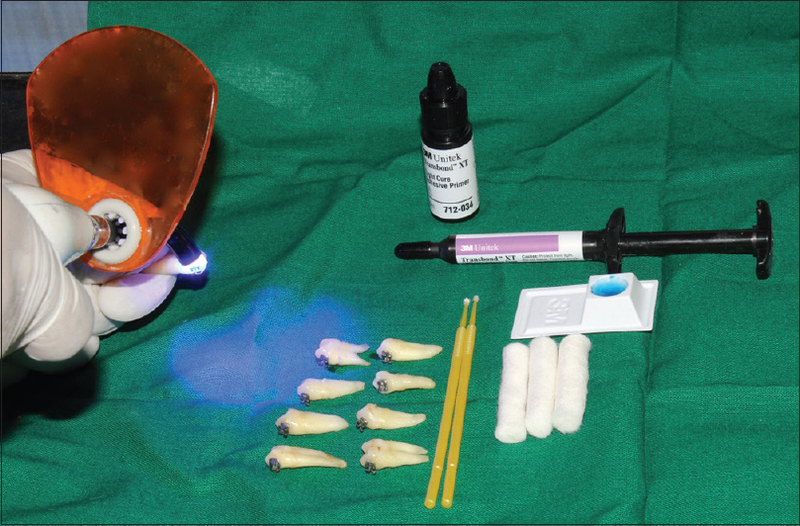 Effect of acid-etching on fluoride-treated caries-like lesions of enamel: A SEM study. ASDC J Dent Child 1997;64:344-8. Horowitz HS, Ismail AI. Topical fluorides in caries prevention. In: Fejerskov O, Ekstrand J, Burt BA, editors. Fluoride in Dentistry. Copenhagen: Munksgaard; 1996. p. 311-27. Marinho VC, Worthington HV, Walsh T, Chong LY. Fluoride gels for preventing dental caries in children and adolescents. Cochrane Database of Systematic Reviews 2015. Professionally Applied Topical Fluoride. Evidence-based clinical recommendations. J Dent Edu 2007;71:393-402.